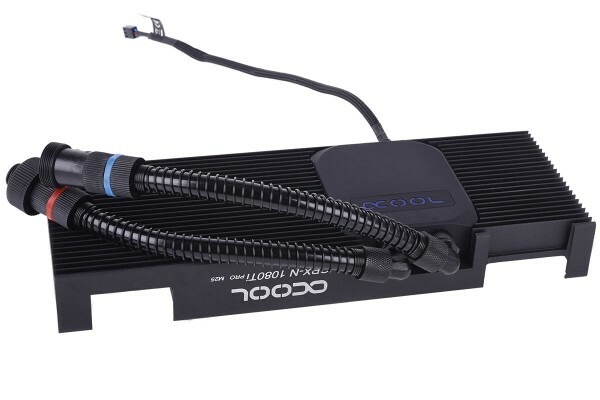 The Alphacool Eiswolf 120 GPX-Pro is the first prefilled water cooler for graphics cards with an integrated pump. Alphacool developed a completely new pump design to minimize the pump's volume and increase performance, and the suction pump was born. Through its suction principle, less turbulence is created in the water, allowing for a more even flow. This also makes the pump nearly inaudible - a first in the AIO market. The hoses and connectors are also based on standard water cooling components. The hose is encased in anti-kink springs and comes in the 11/8mm size. The connectors have standard G1/4" threads and can therefore be exchanged for any other model or size desired.